The Cute Gardener and I tend to spend our entertainment budget money on food. While other people are spending dollars on clothes and toys and second homes and playthings, we tend to live low on the consumerist radar in lieu of once a week forays into the culinary landscape. Whether it be low brow Sonoran hot dogs on a trip to Arizona or the latest farm to table $200 gastropub to crop up in downtown L.A. our indulgences lie weekly in the adventures of tasting. This both inspires and drives the way we cook at home. Sometimes we keep it simple, like when the Cute Gardener whips up something from his never boring oeuvre of Italian pasta or Asian stir fry dishes based on whatever vegetables are currently sprouting in the garden. And once a week, I make a meal that is like me: messy, complicated and typically soaked in French undertones. Because we eat out so much we have a high bar to gauge our cooking. The CG who’s been cooking for himself the past 25 years typically meets that bar or surpasses it, making me a spoiled girl. When it comes to me, who’s only seriously endeavored into the world of home chef-dom for the past five or six years, though, it’s hit or miss. Sometimes a dish turns out remarkably well as with a recent olive tapenade-stuffed game hen and other times it flops miserably like the time I halved the beef called for in a beef wellington recipe but didn’t adjust the cooking temp and time accordingly producing an overly dry bastardization of a high caliber filet. So I bring humor and hope into my ambitious weekly cooking evenings and a dash of the low expectations that come when you know you are an amateur dabbling in the big leagues. When we first met the CG told me that, as much as he appreciated the loving intention that went along with a woman wanting to cook for him, I should be warned that he has eaten out way too much for anything to impress him on the home front so I shouldn’t take anything personally. In our three-year relationship, I have heard him take a bite of two distinct dinners of mine and immediately say “This is good.” I thought that was a remarkable accomplishment. Last week I finally heard the holy grail of compliments escape his lips while biting into a slab of pork loin roast I made. He said, “See, meals like this make me wonder why we go out to eat.” Of course, he wasn’t serious about us not going out to eat –in the ensuing days after that comment we enjoyed Scratch Bar’s lovely cured pig’s heads and pink and purple pickled foods followed by a dash into Barney’s Beanery for a dessert of chili cheese fries. But I have been waiting to hear those words come out of his lips for three years. So back to my learning curve-raising roast. Dorie Greenspan has been my silent mentor as I chip my way through her “Around My French Table.” So far, she has not served me wrong as I use her book as my personal classroom. Despite the fact that I have a tough judge and coach at home, I continue to try difficult things because over time, like with anything that requires practice, I perfect subtleties that benefit my cuisine overall. I learn when my oven times should be tweaked because I know the elevation of my home is different than the recipe originator’s. I know when I can leave an ingredient out and when I can’t. I know when I can substitute a vegetable for another and when I shouldn’t because of things like water content or fiber. I learn personal golden rules like always massage olive oil into kale before using it for a salad or never cook fresh peas for more than a minute in a hot pan lest they shrivel. And I raise my own cooking curve to challenging new heights. 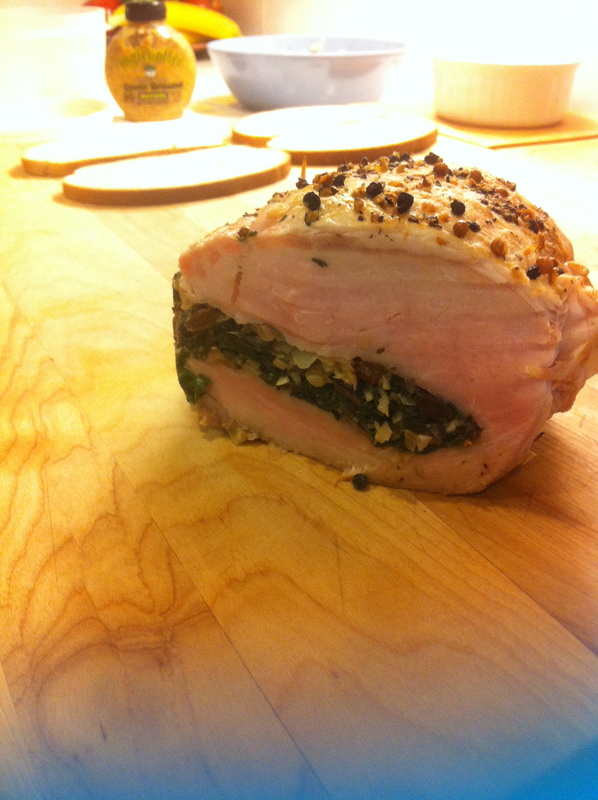 This is why I was pleased as punch to see my chard stuffed pork loin emerge from the oven last week with sublime “just pink” flesh and a dense and juicy tenderness. Here’s Dorie’s original recipe with my own notes added at the end. Wash the chard well. Trim the ends of the stalks, about 1/2 inch or so. Then, cut or tear the leaves away from the center ribs. Finely chop the ribs and tear or roughly chop the chard leaves. Heat 1 tablespoon olive oil in a large, heavy-bottomed skillet or Dutch oven, over medium heat. Add the onion and garlic and cook, stirring occasionally, until the onion is translucent and starts to color, about 5 minutes. Season with salt. Add the chard ribs and cook for another 3 minutes. Add the chard leaves in two batches, adding the second when the first wilts enough to make room for it. Cook until the chard is tender, about 5 minutes longer. Stir in the raisins and transfer the mixture to a medium bowl. Add a pinch or so of the chili flakes, plus salt and pepper, to taste. Preheat oven to 375 degrees. Wipe clean the pan used for the chard mixture and place the pan in the hot oven. Crack the peppercorns and coriander using a mortar and pestle or place between two sheets of waxed paper and pound with a mallet or skillet. Set aside. If your butcher has not already done so, use a long, sharp knife to make a lengthwise slit in the pork roast, taking care not to cut the meat in two, about 1/2 inch from the outer edge. Open the roast and spoon the stuffing onto the meat. Close the meat around the stuffing and tie with kitchen twine, at intervals, replacing any stuffing that escapes as you go. Rub the pork with the remaining tablespoon of olive oil, season with salt and rub the crushed peppercorns and coriander into the meat. Carefully remove the hot roasting pan from the oven. Place the pork loin, fat side up, in the hot pan. Roast uncovered and undisturbed until the thickest part of the loin, not the stuffing, reaches 140 degrees Fahrenheit. Check at 25 minutes but expect that it will take about 40 minutes. Once the roast is done, remove from the oven and tent lightly with foil on a plate or cutting board. The pork should rest for 15 minutes. I did not have kitchen twine so I used two skewers through either end of the open side of the meat and they worked just fine. My chard leaves in the garden were massive so I only used three. I used dark raisins instead of golden and they substituted well. I served this with a kale, dried cranberry, and crushed almond salad lightly dressed with olive oil and lemon juice and a Parmesan polenta with parsley. So, it’s no surprise that today, I constantly seek out a version of the comfy Jewish living room – one where you can hunker down without any airs in any old clothes you’ve swiped from your drawers and eat a good meal surrounded by good conversation. One where lazy time and a flutter of activity not driven by a to-do list but by the constant hustle and bustle of alive and awake minds thrives, even if the bodies those minds occupy are currently slumped over a bowl of gargantuan matzo ball soup. 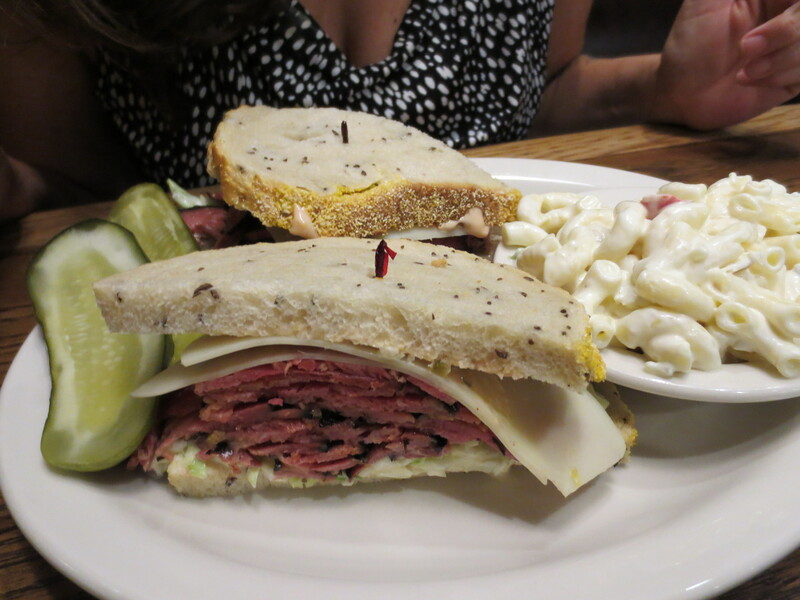 Last week on our first trip to Greenblatt’s Deli in L.A., I sunk down on my plush brown faux-leather booth seat and told the Cute Gardener I wanted to come back forever, as we grew old, bringing newspapers to camp out with under the stark, pale yellow lights. I think I feel a short story brewing that will take place in a Jewish deli and will require lots of live research in my new favorite pseudo-den. I have been banned from ordering dessert at restaurants for a while. This is mainly because the same thing always happens. The Cute Gardener and I will go out and eat a stellar meal. In my sweet tooth of a brain, I will naturally assume that the restaurant’s desserts will live up to the preceding entrees so I will want to try a bite. I will be so full though, that when the item arrives, I end up taking a nip and leaving the rest the responsibility on the Cute Gardener’s gullet. Not being a sweet tooth kind of guy, he will end up spooning it in regardless—both of us leaving full and trying to recall the savory bites of a meal that came prior to the sugar onslaught. I’ve come to realize that deep down this impetus for something sweet at the end of a meal signifies something in me I have completely outgrown. When I was a kid my cravings for sugar were wild and unfettered-completely immature and unsophisticated. It didn’t matter if they were sated at the bottom of a bowl of M&Ms the morning after my parents’ parties; through a grocery store candy bar or a la-dee-da scoop of Haagen Dazs … I was an emotional eater who used sweets as a way to feel fill a hole inside of me that was hankering for love and warmth. In my twenties, after realizing this through years of expensive therapy, I went through a complete backlash towards sugar and became the ultimate sugar snob choosing to only eat bitter dark chocolates and Chinese mochi confections, assuaging myself with the knowledge that the red and mung bean paste delicacies were actually holistic forms of ancient Asian medicine. I would let down my guard once a month though while raising my daughter when we would have our mutual “women’s issues” that called for a slice of chocolate cake with fudgy frosting and lots of almond milk to soak it up or a pint of old fashioned Thrifty’s mint chip or cotton candy ice cream. But other than that, Tofutti cuties were about the only dessert-esque thing you’d ever find in my freezer. When I met the CG my sweet tooth was reignited due to his pure butter-soaked thumb when it comes to baking. After tasting his sinful cocoa cookies, the best chocolate chip ever, and a barrage of cakes from lowbrow to highbrow whipped up in his kitchen, I found myself a willing slave to the dessert cart again. But now here I sit almost three years of dating later and realize I need to evaluate my ideas about sugar yet again. Somehow I feel like this will be a constant relationship of revision throughout my lifetime. Dark chocolate is the only chocolate. Unless it’s butterscotch Blondie chocolate. Or caramel Valrhona chocolate. Maybe, Valrhona is the only kind of chocolate. No, that’s not true. The next time I eat a macaron it will be in France. Anything white with coconut is fair game. Leave the cake making to the Cute Gardener. Only eat pastries if buying from the baker who baked them within the last 24 hours. Ice cream is over rated after age 12 unless made fresh with more eggs and cream and less artificial flavoring. Pies are only good when they are filled with roasted root vegetables or fresh, sustainable meat. Fact: fresh whipped cream and a spoon constitutes dessert, nothing else needed. Truffles from boxes will always taste like wax. Dessert IS allowed at restaurants if chosen from the savory, dinner menu like the CG and I once did with broad beans and white truffles when The Royce still lived prior to its takeover by a boring steakhouse. And then there are the surprises—those things you have to try just because you have never heard of them and may never have the opportunity to taste them again. This was truly the case this past year at Gusto when I had a slice of pie that tasted like the moon. A heightened triangle of fluffy white topped with toasted coconut and a curl of chocolate fonduta arrived on a bed of Graham cracker crust to my delight at the end of a nice Italian artisan pasta and meatballs dinner. In today’s contemporary sea of cardboard-crusted chocolate and fruit tarts, tangy ganaches and variations on trendy ice cream flavors like crème fraiche and cinnamon, it came floating to my table like it had been carved from a cloud. 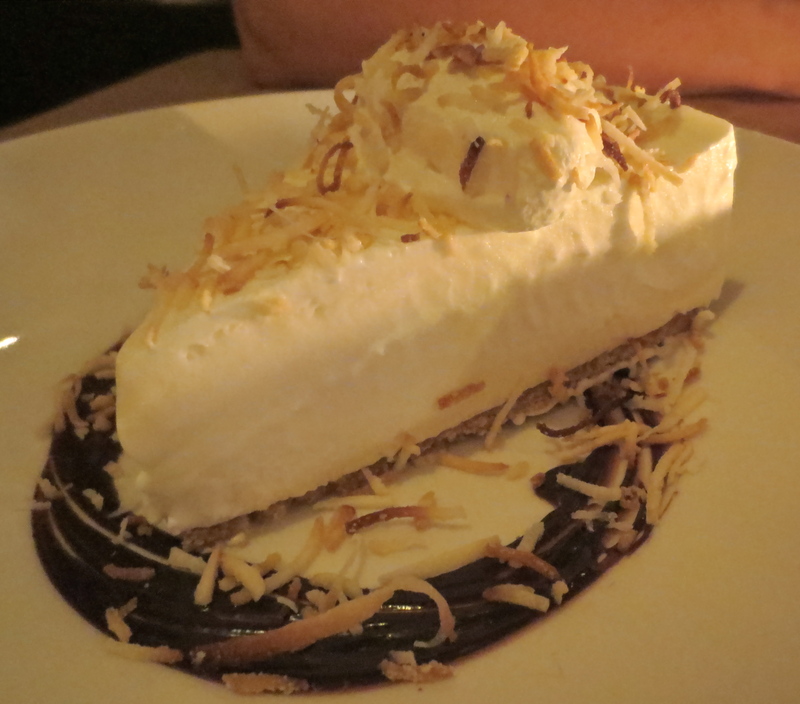 Had I been banned at that time, I never would have discovered the unique piece of heaven that is coconut gelato pie. … as I sit contemplating another slice of the five-minute brownie pie I begged the CG to whip up last night for a Roberto Rossellini film. When it comes to living full and healthy lives, the Chinese have longevity down. A big component of this truth is the way they inherently know that what you put in your body, mind and spirit affects your quality of existence on this planet a great deal and if it’s consistently poison, you are going to suffer the consequences. Part of that is attributed to the way they incorporate whole, pure and fermented foods and a wellspring of herbs into their lives on a regular basis. Not waiting until the flu knocks on their doors, they habitually eat medicinally with prevention and maintenance in mind rather than using medicine as just a drastic reaction when the bugs of illness decide to strike. I have adopted this system for myself over the past few years, inspired by my course of study in planetary herbology and nutrition. Because of this, I have a steady weekday lunch regime of soups, salads, rice porridges and bean dishes that fill out the middle between my gluttonous and adventurous foodie weekends. 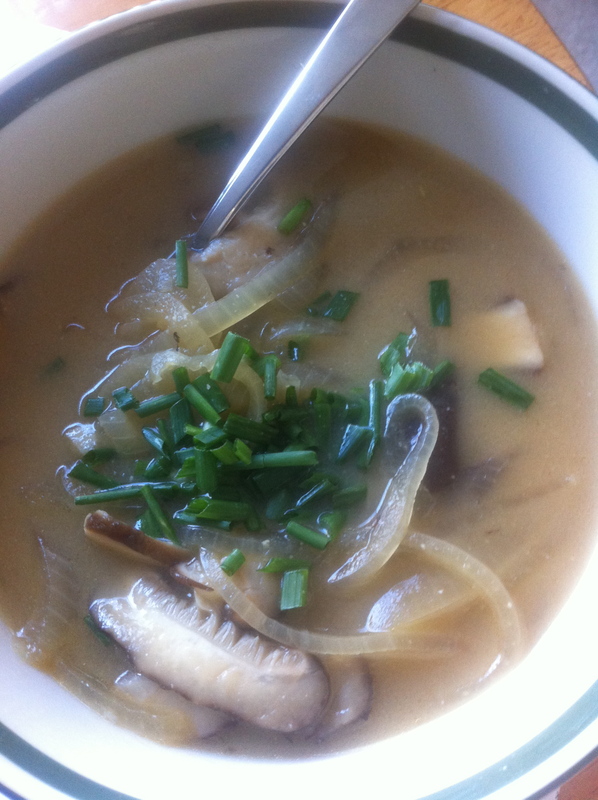 One of my go to soups is a luscious and super simple miso mushroom. 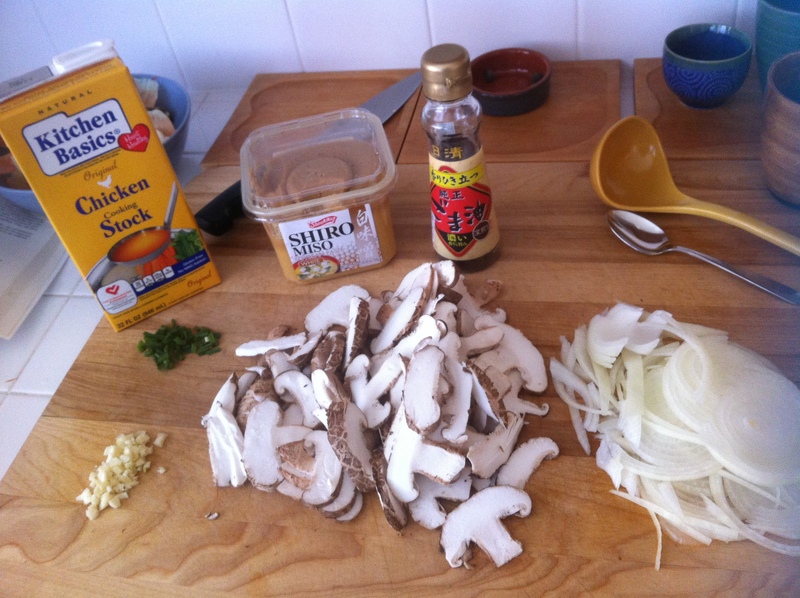 Mushrooms are regarded as medicine because they are said to nourish the shen, or spirit. The shiitake in particular is most commonly used in Chinese cuisine and is the second most commonly grown mushroom in the world. It is said to have antitumor, immune-regulating, antiviral, antibacterial, antiparasitic and anticholestoral properties. In Asia, miso is considered one of the most perfect foods because it consists of easily assimilated high quality protein. It also aids assimilation of other foods with its digestive enzymes, lactic acid bacteria, salt-resistant yeasts and healthful organisms. Contrary to popular belief, it is not full of salt but actually only 12% salt which is less than you would use having to season a dish with salt yourself – yet it imparts the same rich, umami flavor of salt naturally. Together in a quick midday soup, these two ingredients go miles beyond providing a healthy lunch – they also calm the soul, rejuvenate the brain for the afternoon lull and impart ultra vitamins to your entire body to boost your physicality’s karma for those moments when you are going to want to indulge. 2 tablespoons minced parsley, chopped chives or leeks –or all three! Saute the chopped mushrooms, onion and garlic in an iron skillet until the onions become translucent. Add the vegetable stock (or water) and bring to a boil. Lower the heat and dissolve the miso paste into the broth, simmering another ten minutes. Serve warm with a dash of soy and the parsley, chives, or leeks or a combination of all three!